The Knitting Pirate » In Which the Pirate Increases. « In Which the Pirate Finishes Spinning a Yarn. In Which the Pirate Increases. Once I got past the heel of the handspun sock, I realized that with my inconsistent gauge (because the yarn isn't entirely consistent) it might not be a bad idea to work the leg in ribbing. I decided on a 4x2 rib and worked my way up. When I reached my usual stopping point for socks, there was still a lot of yarn left in the ball - which is just half of the total yarn I spun up - and so I decided to make these knee socks! They're so thick and cushy, I'll only be able to wear them in the winter anyway... so why not keep my whole calf warm? But knee socks require increases to fit around one's calf. 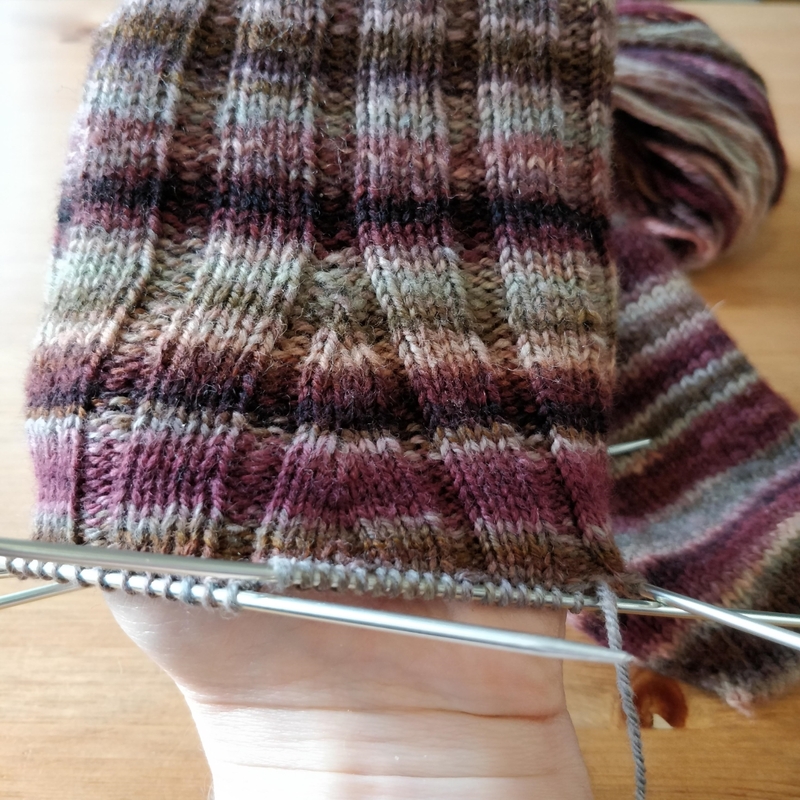 I measured the sock, my leg, the gauge I was getting, and then I looked at examples of ribbing increases to see different ways it could be done. The center of the back of the sock was on one of the purl gutters, so I increased in the gutter, one new purl stitch every other round. When I had four purls in a row, I changed to adding one new knit stitch every other round. Before long, I had a whole new rib. Four rounds later, I did it again but the other way - since the center of the back was now a knit column, rather than a purl gutter, I started adding knit stitches first. When I had eight in a row, I added the new purl gutter in the middle of them. This entry was posted on Wednesday, June 6th, 2018 at 10:00 and is filed under handspun, sock, toe-up. You can follow any responses to this entry through the RSS 2.0 feed. Both comments and pings are currently closed.